Those Girls is the brainchild of two Melbourne mates, Elena Andoniou and Lauren Davie. 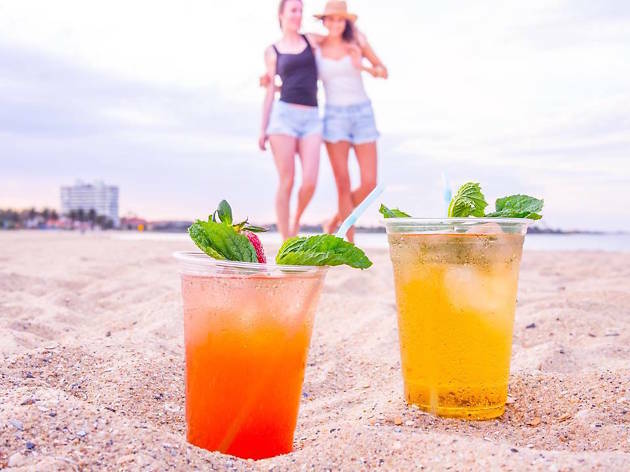 Together, they aim to quench the thirst of patrons at pop-up at events, markets and festivals with their incredible iced tea. Andoniou and Davie have been best friends for most of their lives and dedicated tea aficionados from way back. The two appeared on Shark Tank in 2015 (Australia’s version of Dragon’s Den) and so impressed the judges that they secured a partnership with business magnate Steve Baxter. Since then, their mobile tea emporium has grown exponentially – they've got 12 staff and a HQ in Collingwood. That said, both continue to be incredibly hands-on with the business: they wake up before six daily and are involved in everything the rigours of small business requires, from overseeing human resources and marketing through to a spot of carpentry and styling for photo shoots. The pair source high-quality black and green teas from China, India, Sri Lanka and Australia. Their iced teas are then lovingly blended and brewed with the finest and freshest local ingredients, and, like the travelling samovars of old, they serve their teas from giant porcelain urns. Their imaginative favour combos are exotic floral, herb and fruit melds – think hibiscus and honey, lime and mint mojito, blueberry and mint or strawberry and rosemary. Catch Those Girls (plus a bunch of other awesome owned and operated small business vendors) at the Square Market.